The older two kids have been asking to visit NYC for years. It’s been hard with Mason being so little but we finally decided to make the trip. 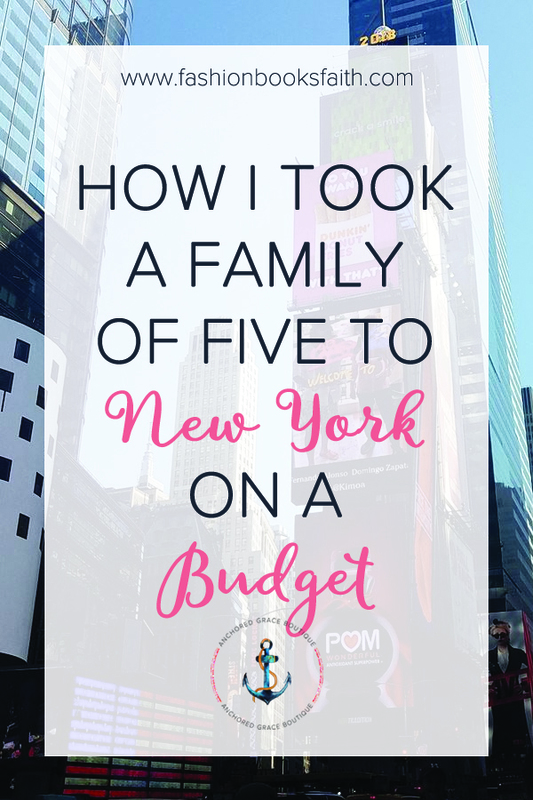 Here’s how I took a family of 5 to New York on a budget. The last few times we went to NYC, it was before Mason was born and the kids didn’t go with us. The kids have been begging to go to NYC for years but taking to teens and a baby to NYC never sounded like a great idea. We finally decided this Summer to take the trip. I will say that we tried to bribe them into a beach trip for days ahead of time. Usually, I over plan for every trip. NYC is a big undertaking and a day trip really isn’t enough. But I’m really good at jamming everything. Just ask my mom, we saw everything in one day. I’m mega OCD – think trip index cards and no veering off track allowed. This trip I decided to be more spontaneous. This was for two reasons – one we really planned the trip last minute and didn’t have time for my OCD planning, and two with three kids I didn’t know what we would actually be able to accomplish. We decided to split the trip in two with an overnight in the middle. This would give us and the kids a break if they were tired out. We left home mid-morning for the trip into the city. It’s a four-hour drive for us so we planned it around rush hour. I didn’t want to be driving into the city during rush-hour. Normally, when we head to NYC, we stay in New Jersey – Secaucus is close, has a train that takes you into the city and is very reasonably priced. 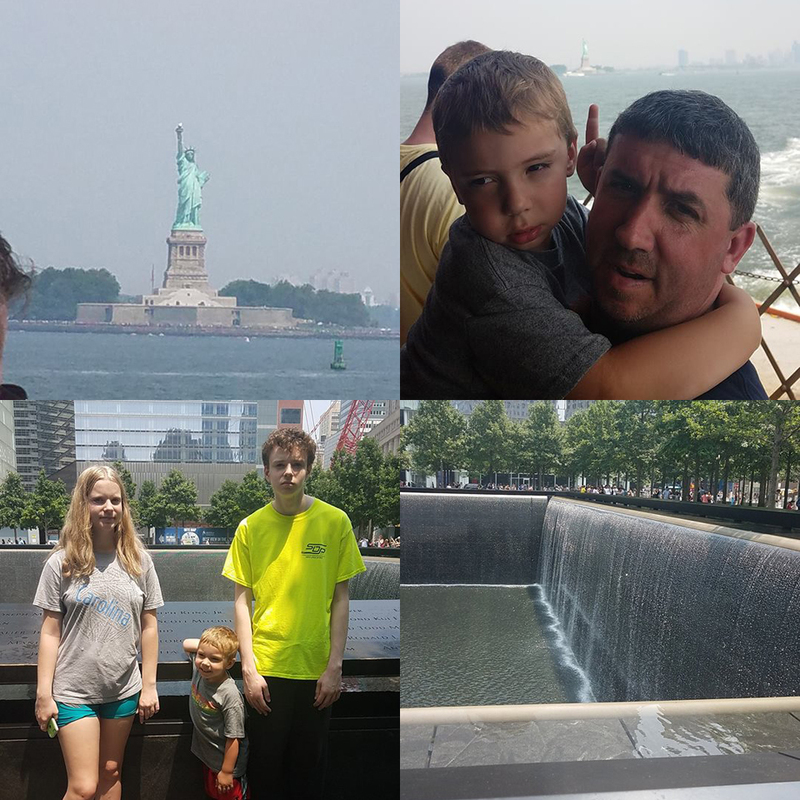 This trip was a bit different, we wanted to give the kids the full NYC experience and I had a lot of hotel points saved up. We booked a room at the Tryp by Wyndham. The hotel is walking distance from Times Square and they had an awesome family room. When we arrived our room wasn’t ready but they gave us a coupon for free drinks and snacks while they finished it up. We headed to the bar for a few drinks and a snack until our room was ready. We went up to our room and I’m just going to say wow! This room was amazing, and if you’re traveling with a big family this room was great. We didn’t have a view from our window but the kids loved how much space there was. The room had two queen beds, bunk beds, and a pull-out sofa. After our trip to Hershey Park the week before we were super excited to not share beds. There were two televisions so no fighting over what to watch. The room had a chic, elegant look to it. But the absolute best part was the shower. They had an amazing rainwater shower – I’m going to need one in my house after that one. I will note that the air conditioning wasn’t working that day. We went into the city that evening and when we returned they sent up a maintenance staff member up to fix it for us. The first night we were there, after checking into the hotel, we headed into the city. With kids, we definitely needed to take the Subway numerous times. That was the most expensive part of the trip for us, so try and plan ahead where you’re going so you’re not doing a lot of back and forth. 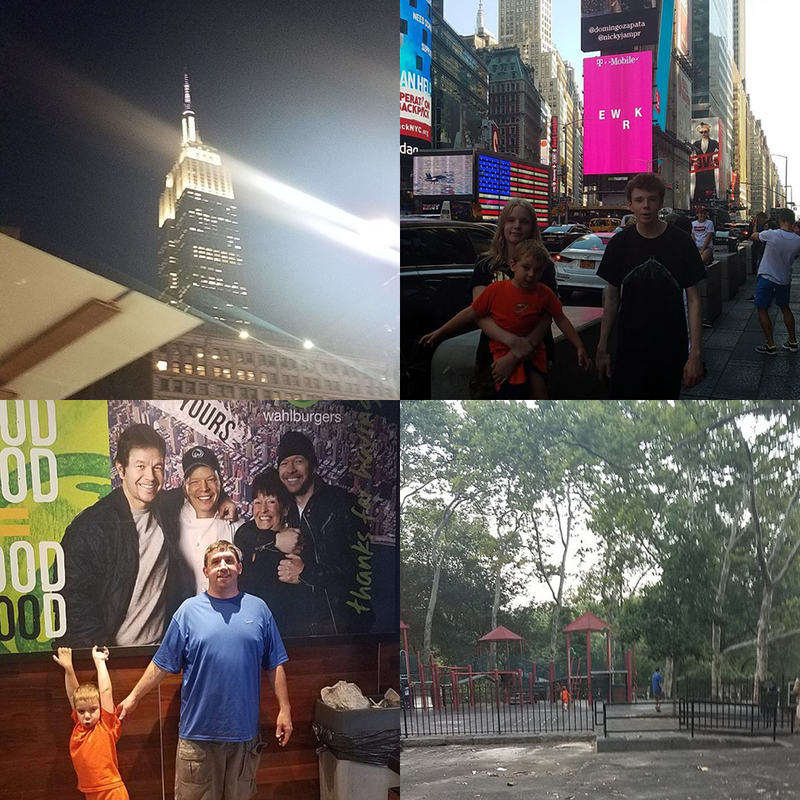 We walked from our hotel to Times Square – it was a long walk but close enough that the kids could handle it. We visited a few stores and the kids got to experience the wow factor of being in the city. From there, we headed to the Supreme store. I don’t get this store – but it was Noah’s request so we found it. It’s an expensive store that you have to wait in line to get in. So, I don’t recommend it as part of a budget-friendly trip. We just looked in the windows as we walked by. We stopped at Wahlburgers for dinner. This was Sean’s request, he’s kind of obsessed with that show so we had to go. The prices were reasonable, we didn’t spend any more than we would have to go to a restaurant at home. From there, we went to Central Park. We spent a few hours there walking around, playing at the park, and looking at the view. We were happy for Mason to burn off some energy in hopes he would sleep back at the hotel. The hotel was just a block from the Empire State Building so we were able to check it out on our way back to the hotel. We didn’t pay to go up, just checked it out from outside. We headed back to the hotel. The hotel has rooftop access so be sure and head up there once it’s dark for a great view of the city. The second day we were in the city it was overcast. We were worried about rain so we tried to jam as much into the morning as we could. We started out going to Battery Park. You can take the Staten Island Ferry for free and it gives you a great view of the Statue of Liberty. This is free. This specific ferry is free and takes you past the Statue of Liberty. It’s close enough for some great photo ops. Be sure you’re on the right-hand side of the boat on the way there. Also don’t let any of the guides talk you into paying huge amounts for tickets. You can take this one for free. Once you get to Staten Island you have to get off of the ferry and get back on. We were able to turn right around and get on the next ferry back. It takes about an hour round trip to see the Statue of Liberty and come back. Next, we headed for lunch. We let Mason pick lunch so we ended up at Subway but that worked for all of us and the pricing was similar to home so it saved a lot over a city restaurant. After lunch, we headed to the 9/11 Memorial. We only viewed the fountains – we didn’t go into the museum. This was mainly because we were worried about the weather. Mason didn’t really understand the memorial but the older kids learned about 9/11 in school this year so it was good for them to see it. The rain started to come down and you could see the clouds rolling in. We started the trek back to the hotel since we were pretty far from there at this point. We had to stop at Baked by Melissa because no trip to the city is complete without a visit. Baked by Melissa is mini cupcakes, we have them every time we go. We even head them as the dessert at our wedding. We picked up the van and started the drive home. The kids loved the trip – they got to see some of the big landmarks they had only heard about before. Have tips about visiting New York on a budget? Want us to visit your hotel or city? Drop me a message or head over to our group and discuss there.